Home Costs > How Much Does Asphalt Resurfacing Cost? How Much Does Asphalt Resurfacing Cost? Asphalt resurfacing is a process used to repair an asphalt driveway, street or parking lot, and like anything, asphalt has its flaws. For example, asphalt surfaces can begin to crack over time, especially if the foundation wasn’t perfect, but thankfully, there are options when asphalt needs to be repaired. For starters, you can choose to simply patch the areas that are in poor condition and fill the cracks that have appeared. Another option is repairing the area, which would entail ripping out the old asphalt and reconstructing the foundation. Asphalt resurfacing, however, is a simply a layer of asphalt, usually one to three inches thick, that is laid on top of the existing asphalt, creating a new appearance. Depending on the company performing the job, the size of the job and geographical location, the costs for asphalt resurfacing will usually range around $1.50 to $3.50 per square foot. For example, a typical driveway which measures 750 square feet could cost $1,125 to $2,625 to resurface. Most quotes are fairly straightforward, and it can be easy to get quotes online as long as you know your driveway dimensions. If you don’t want to bother researching contractors or you don’t know where to start, consider getting free quotes by using HomeAdvisor.com. Here, you can provide your dimensions, pictures and receive quotes by email or phone. The estimates mentioned above, at a minimum, should include cleaning the old surface, chipping away the edges to ensure adhesion and applying a new topcoat. The process should be able to be completed in a day. According to DrivewayGuide.com, the cost of asphalt resurfacing is less than having a new asphalt driveway installed. The cost of asphalt replacement, where a fresh topcoat is placed onto the old asphalt surface, is around $1.50 to $2 per square foot. A good asphalt driveway can last up to 20 years. If the driveway is older than this, it may have to be replaced completely. If your driveway had to be repaved, then it’s safe to double or even triple the estimates you initially received. If you were to want patterns or colors, this could increase the costs to as high as $8 per square foot. Resurfacing is faster and much simpler when compared to repaving a driveway, and as mentioned, resurfacing involves applying a new driveway over the older one. The first step involves filling in any cracks to create an even base. 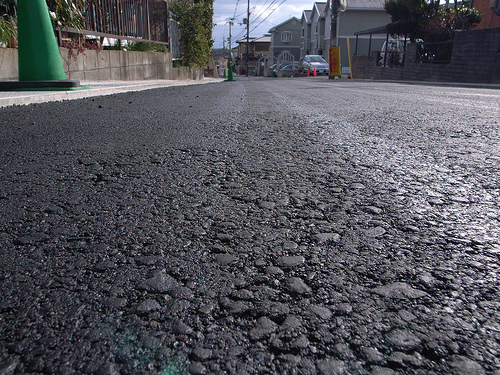 Then, a new asphalt layer is applied, ranging from one to three inches thick, depending on the circumstances. Finally, a heavy rolling machine flattens the new layer to create a new looking driveway. Don’t confuse resurfacing with resealing because the two are completely different. Resurfacing involves applying a protective coating to the asphalt, while a resealing job protects your driveway from the elements, effectively prolonging its life. Experts recommend resurfacing your driveway when more than 30 percent of your driveway is cracked. In the future, experts highly recommend sealing your driveway every year to prolong the driveway’s life. As with any contracting job, be sure to get three to five quotes before deciding on a quote. Aside from focusing on a price, always make sure the contractor is insured, licensed and has reputable reviews online. You will also want to drive by previous jobs to see how the resurfacing has held up. Many contractors are happy to offer you a free estimate.